5. My copier has a C-#### error code. What do I do? 6. I would like to print to/scan on my departmental copier. How do I do that? Proper use and care of copiers is vital. 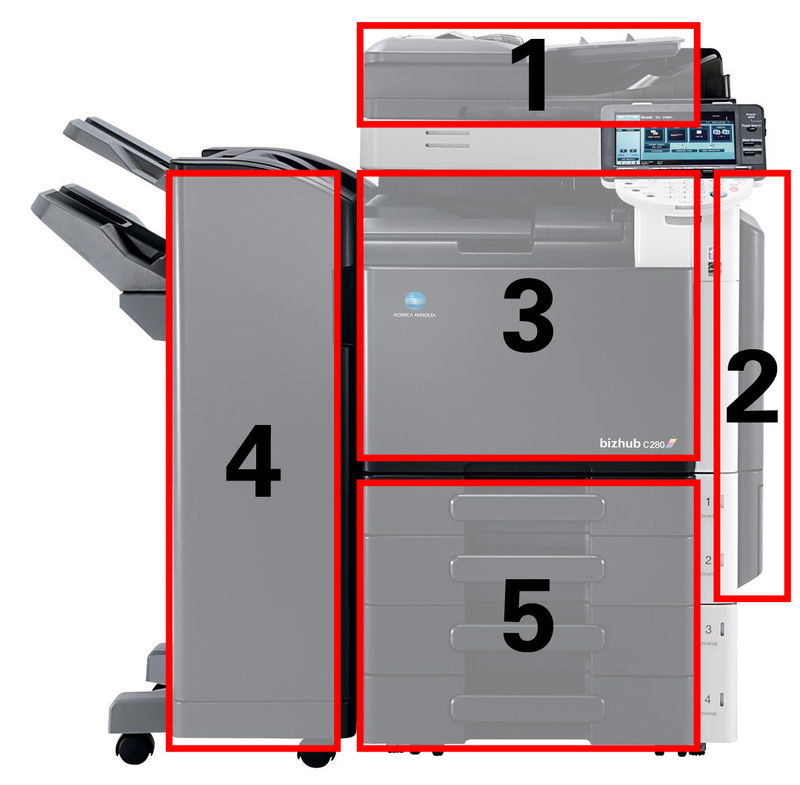 The following guidelines will enhance copier reliability for all users. Follow the alerts on the copier screen. It will guide you to the sections that have jams. Remove all paper (including small pieces) at each site. Open and close doors and working parts gently. Many of the nobs and handles for clearing paper jams have arrows on them indicating which direction to turn them. Work from the back of the machine toward the paper exit. Clear jams in the paper drawers last. See the diagram below as an example. Not all areas will need to be cleared in all cases. If you cannot locate a jam, call x3737 and someone from Print & Copy Services will assist you. Avoid pressing copier lids onto books—this can shatter the copier glass. 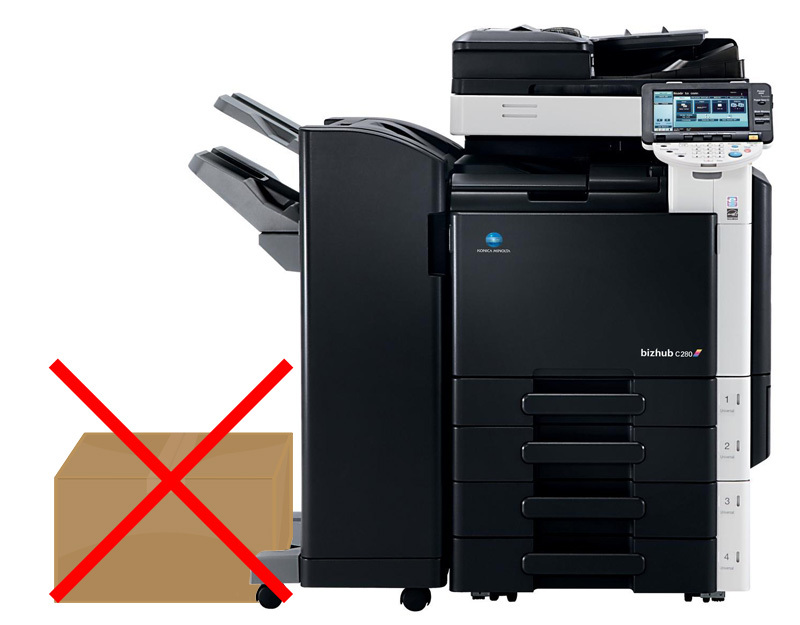 Replace copier toner when indicated. Copier toner is free from Print & Copy Services. We always have a supply on the shelf. You may request toner with your paper order or any time it is needed. For more information about ordering toner, see Ordering Copier Supplies. Avoid copying books in a manner that creates a black page edge. Black edges cause paper jams. To prevent this, mask the edges of the book with white paper or use the "non-image area erase" function on your copier. Plug copiers directly into the wall. - Do not use extension cords. - Do not use surge protectors other than those provided by Print & Copy Services. Do not place anything under copier exit trays. This includes garbage cans, recycling bins, boxes (empty or full), reams of paper, chairs, or step stools. For training on any copier on campus, call Print & Copy Services. Arrangements will be made for training sessions. Always replace copier toner when indicated. Do not shake the cartridge to "get more out of it". If you don't have spare toner on hand, you can order it through our online order system or pick it up in person from our office. Copier toner is free from Print & Copy Services. We always have a supply on the shelf. You may request toner any time it is needed. Contact Print & Copy Services and we will be happy to replace the waste toner cartridge for you. We always have spare staple cartridges on hand for your copier. You can order extra staple cartridges through our online order system or pick them up in person from our office. If you're unsure how to replace the staple cartridge, please don't hesitate to contact us. We're happy come out and show you. Copiers need routine maintenance to keep them in good working order. Please contact Print & Copy Services if you copier is displaying a message that its time to schedule Preventative Maintenance. 5. My copier has a C - #### error code. What do I do? First try opening and closing the door to reset the copier. If this doesn't remove the C-#### code, contact the Technology Service Desk at 253.879.8585 or servicedesk@pugetsound.edu. 6. I would like to print to/scan from my departmental copier. How do I do that? Contact the Technology Service Desk at 253.879.8585 or servicedesk@pugetsound.edu and let them know which copier you'd like to be able to print to and/or scan from. They will contact you and schedule a time to install the necessary drivers. Be sure to provide your Puget Sound username, your department, and your preferred copier. If you have questions or concerns, contact Print & Copy Services at print@pugetsound.edu or 253.879.3737 for assistance.